Simple, loud and funny, this story is a total triumph. One dinosaur chomps another in this food chain cumulative story, and all is well until, "The bite buzzed..." causing T-Rex to rather loudly "BUUURP!" the other dinos free again. 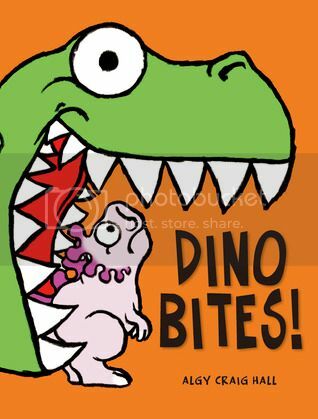 Dino Bites has enormous kid appeal, large, colorful illustrations with bold dark outlines and a very simple text, sometimes only one word per page. This story is perfect for reading aloud to large groups. 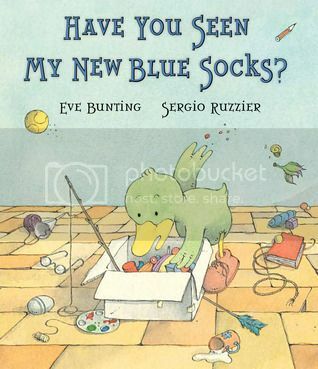 A little green duck has lost his new blue socks, and searches high and low for them, asking everyone he meets if they've seen the erstwhile footwear in this rhyming tale. Having checked his box, his friend Fox, Mr. Ox and some peacocks, he goofily realizes... he's been wearing them this whole time. I loved the quirky hidden details such as Fox sitting down to eat a bowl of grapes and in Duck's messy house, presumably a baby picture of him as an egg. Colorful pen, ink and watercolor illustrations hint at a Dr. Seuss-like sensibility. I highly recommend this not only as a read-aloud but for beginning readers as well. A frog, a snake, an eagle, a lizard and all fight over an egg they find in the jungle. After accidentally bonking an elephant on the head, all the animals are very quick to disavow their connection to the egg. 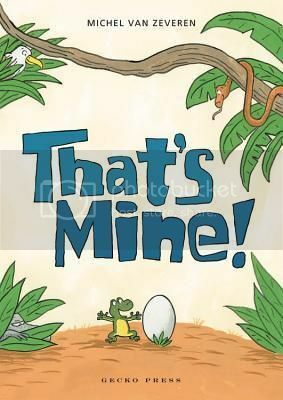 When the egg finally hatches a baby crocodile, she knows exactly who to go to: the frog that originally found the egg. The ending is ambiguous enough, we weren't sure if the crocodile is planning to eat the frog, or simply claiming the frog as a parent. A funny translation from the French language original. 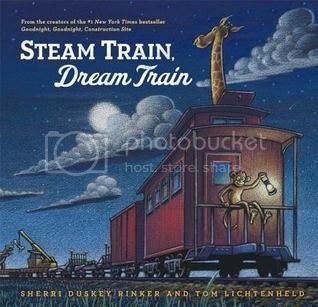 Here is a soothing bedtime train book all in rhyme. Oil pastels give a textured look to the illustrations. Zoo animals and a dinosaur load up their train with toys, balls, paint, ice cream, sand for sand boxes... a bit random, but in short, everything a boy could ever want. End pages feature engineer coverall stripes.